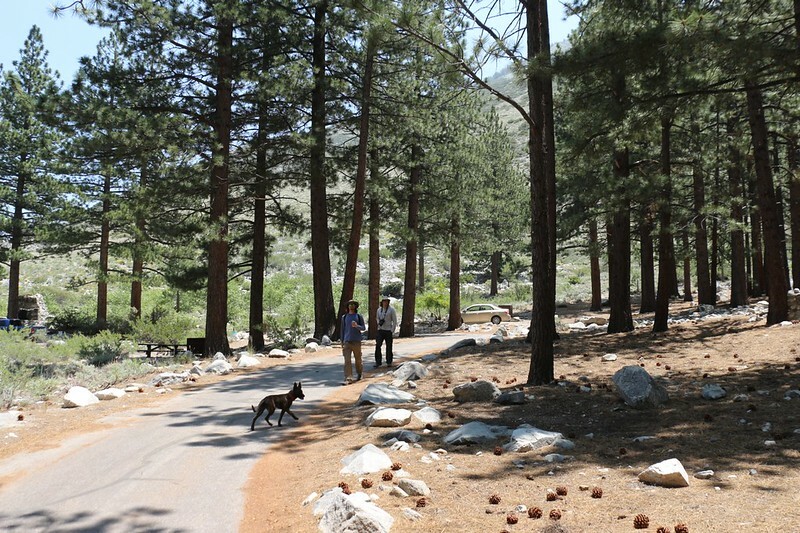 The North Fork Big Pine Creek Trailhead is one of the most popular places in the High Sierra, and securing reservations beforehand is key. Walk-in permits get snapped up almost instantly. 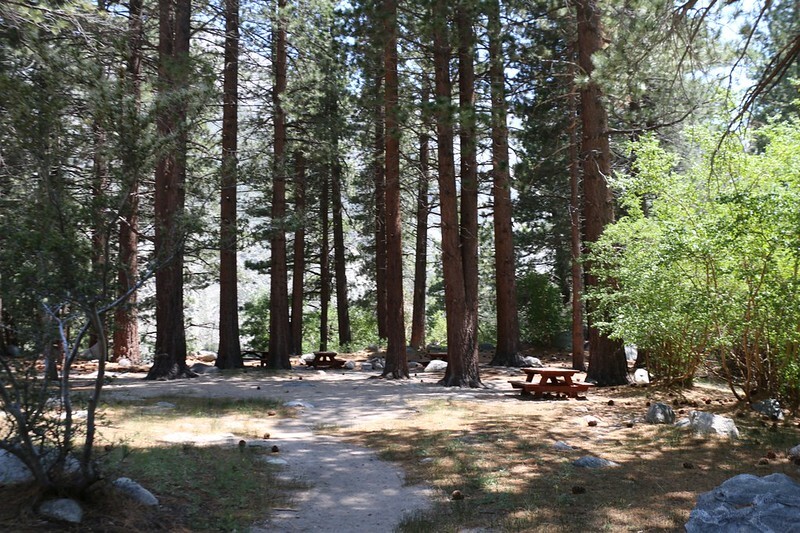 Therefore, back in February, exactly six months before the start of the trip, I made a campsite reservation for the Big Pine Creek Campground, and another reservation for the all-important Wilderness Permit. It was a good feeling, marking the dates on my calendar. And by the time six months went by, we were completely packed and ready. Now, this first day of the trip was mostly about driving six long hours north from San Diego and getting our hiking permit from the Ranger Station in Lone Pine. 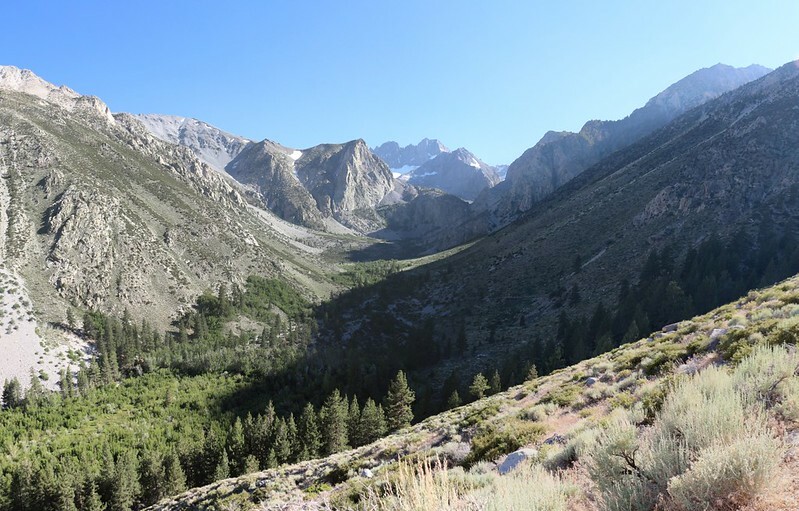 After that, it was simply a matter of driving further north to the town of Big Pine, then taking it easy and acclimating to altitude by car-camping at the official campground the first night. We planned on starting the backpacking phase of the trip the next day at the crack of dawn, as we had a big day planned. But that was tomorrow. Today, once we had secured our campsite, our modest goal was to take a mellow day-hike and check out First Falls, which was only a mile or so away. We grabbed some water and a snack and headed for the falls. The dogs were happy to finally get out of that boring old car, and they kept running ahead of us, and behind us, and all around us. Lots of pent-up energy. We walked to the end of Glacier Lodge Road and started hiking on the trail. 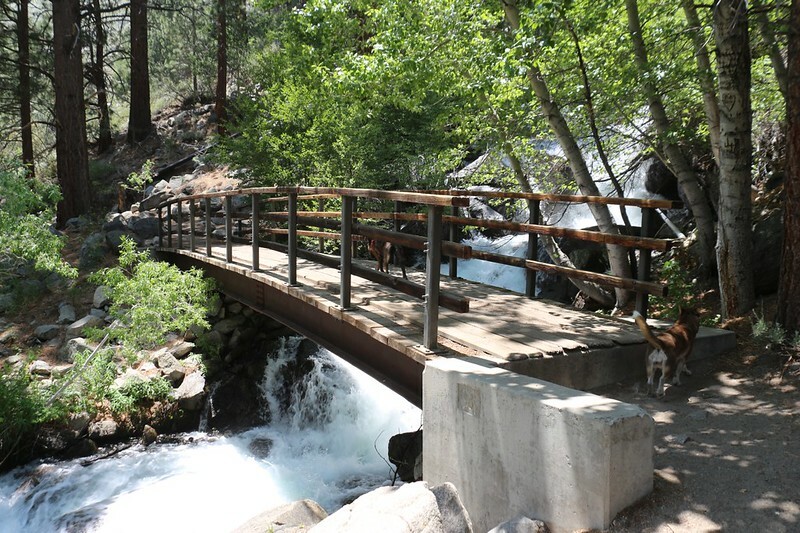 Soon we made it to a sturdy bridge that crossed the North Fork of Big Pine Creek. The water was running strong, cascading down from above. We decided that this was far too short a hike, so we continued uphill on the trail to the top of the falls. We took a break up at the top, and watched the dogs play in the water. They were loving this outdoor hiking action. I checked out the GPS app on my phone and switched the map’s view to the USFS topo. It showed that this was, indeed, the top of First Falls, and it also showed that there was a campground called “Walk-In” close by on the east side of the creek. So we crossed the upper bridge and wandered down there. Lo and behold: There was a wide flat area under tall pines, complete with picnic tables! There was even an old pit toilet that had been boarded up. It didn’t look like anyone had camped here in quite some time. It seemed a shame, as it was a really nice spot. And that’s when I had an idea. Maybe we could camp here tonight! This location was part of the National Forest (not the Wilderness) and probably didn’t require an overnight permit. If we went back to the campground down below, we could get our gear together, move the car to the official trailhead parking lot, and then hike a mile or so back to this spot with our backpacks. We’d be further along on the big hike that was planned for tomorrow, and we’d also be sleeping in the forest, camping peacefully, far away from all the noise and humans and RV generators down in the car-camping campground. When I mentioned this plan to the guys, it didn’t take them long to agree with me. So we hiked back to the car. Luckily, we hadn’t set up our tents yet, so all we had to do was drive away. 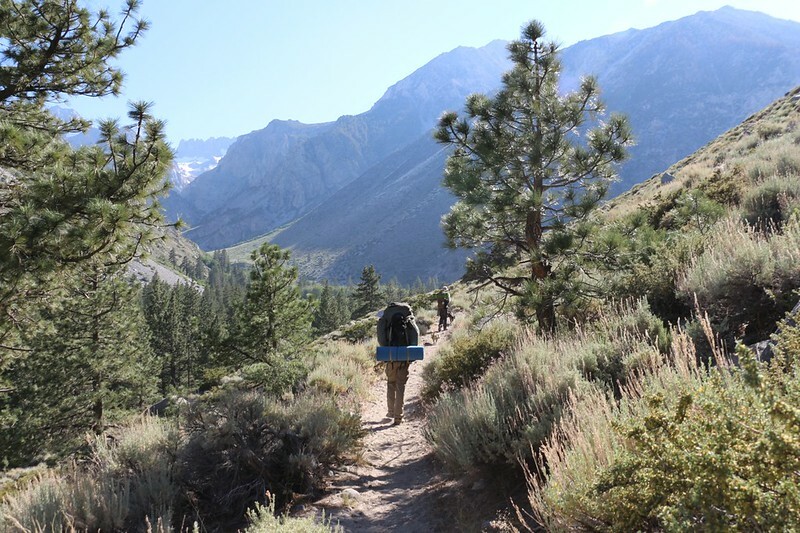 Rather than start hiking immediately, we decided to head back down to Big Pine, and eat dinner at a restaurant. When we got there, however, we discovered that every single eatery in town was closed for the July 4th Holiday! We were sad, but realized that everyone needs to have fun on a day like that, so we headed over to the trusty Chevron station and bought some tasty deli sandwiches. We happily ate them as we drove back up to the trailhead. It didn’t take long to ready our gear. We shouldered our heavy packs and headed uphill on the trail. 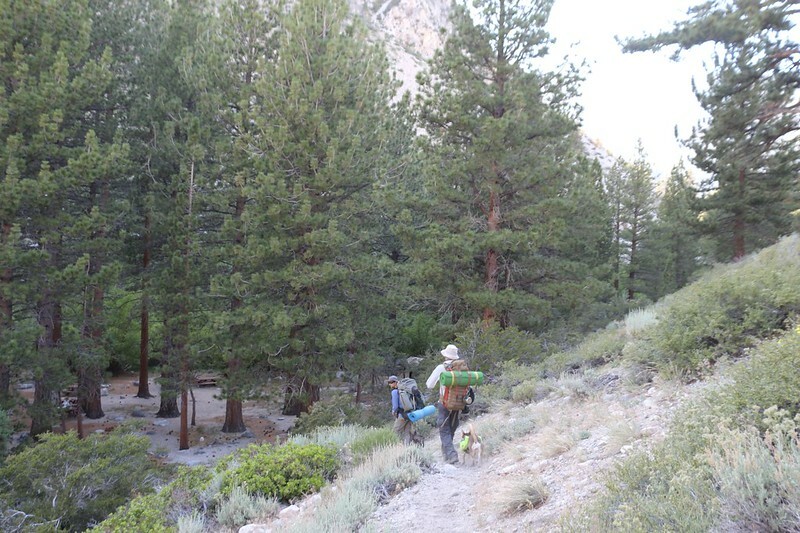 It rose gently along the side of the canyon, and we were treated to fine views up the South Fork of Big Pine Creek. We weren’t heading that way, so this was an excellent opportunity to see Middle Palisade and the Clyde Glacier off in the far distance. Our path lay to the right, on the North Fork. But not today. The trail headed around the corner and entered the forest. We could hear First Falls as it cascaded downward. Soon enough, we saw the Walk-In Campground down below us. It had only taken us a half hour of hiking to get there! Just the same, we were happy to arrive. It had been a long day (we had left San Diego at 3am) and we were looking forward to a good night’s sleep. We set up camp right away. As for myself, I was satisfied with the deli sandwich I’d eaten, but my son and his friend were not. I watched in awe as they unloaded all the food from their backpacks. We were only camping for four more nights, but I’m certain that they’d packed enough food for a week! And they also had plenty of dry dog food. I was glad that I wasn’t carrying that big a load. And I knew they’d be sorry tomorrow, when my plan called for hiking eight miles and climbing five thousand feet. Hmmm… Maybe it was better if they ate some of that food right now. The two of them hung out, talking and laughing as the evening shadows got longer, but not me. I crawled into my tent and fell asleep right away, with the sound of the creek in my ears and the smell of pines in the air. It sure felt great to be back in the Sierras!